Mahathir Mohamad, former prime minister of Malaysia. Photo: PTI. New Delhi: India could have clocked faster rates of economic growth and matched China, the world’s second largest economy, had it been slightly less democratic, former Malaysian prime minister Mahathir Mohamad said on Friday. Initially, India’s socialist leanings came in the way of its economic growth, but since it adopted market reforms in 1991 its progress has been slow due to its democratic practices, Mahathir said at the Hindustan Times Leadership Summit in New Delhi. When Russia changed its economic and political system, its reforms were so radical and implemented so fast that it led to upheavals that stymied economic growth. 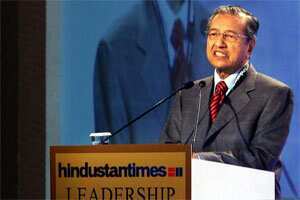 China, on the other hand, was more careful and this resulted in rapid economic growth, Mahathir said. “If India is not too democratic, it will be like China in terms of development," he said. His comments come amid a fierce debate in India on opening up the retail sector to multinational companies such as Wal-Mart Stores Inc. and Tesco Plc. Opposition groups and some allies of the ruling United Progressive Alliance are against the move to allow 51% foreign investment in multi-brand retail—a move Prime Minister Manmohan Singh has said will help bring down food inflation and reduce wastage of perishable foods. India has also seen protests over land acquisition for economic projects such as Chinese-style special economic zones and nuclear power plants in different parts of the country. Mahathir’s arguments were rebutted by minister of state for commerce and industry Jyotiraditya Scindia and opposition Biju Janata Dal MP Jay Panda, who were present at the event. While Scindia likened India’s development process to a marathon rather than a sprint, Panda said: “Our system is evolving, our trajectory of growth is certainly better than it was in earlier decades. We do need to tweak our system, but we do not need to change our system." Referring to the recent international intervention in Libya and earlier in Iraq, Mahathir criticized the killing of people in efforts to democratize societies. “Forcing some countries to accept democracy is something that should not be done. When you kill people so that they can accept democracy...the people who are killed do not enjoy democracy," he argued. Mahathir also rubbished the idea that a country becomes stable and prosperous when it embraces democracy. “Running a democratic country is one of the most difficult things for any government," he said.